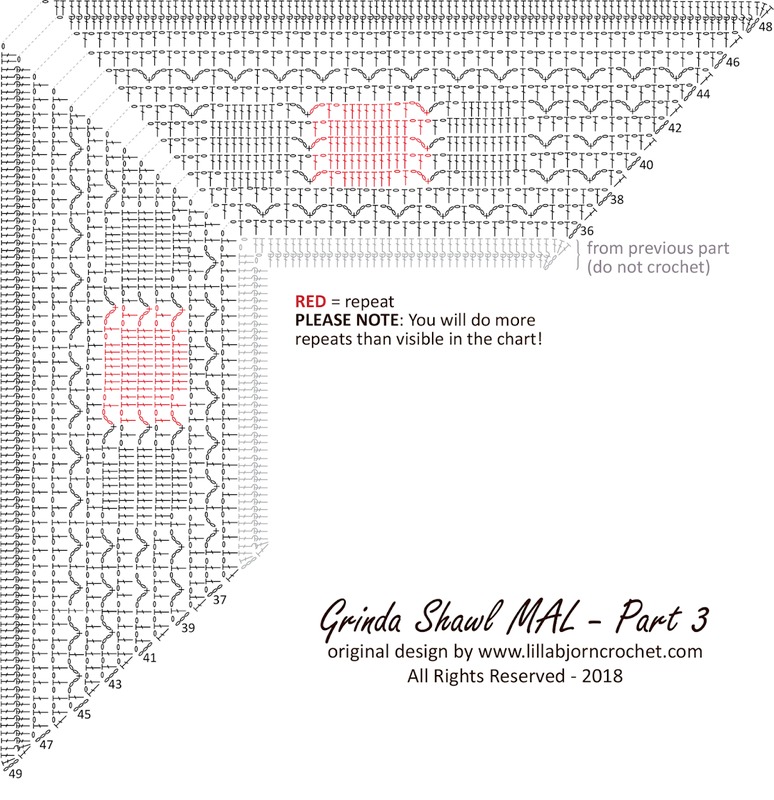 Hello and thank you for joining Grinda MAL. We are slowly approaching third part and I hope you are doing great! Today the pattern will slightly change and we will be building “polka dots”, or large islands. 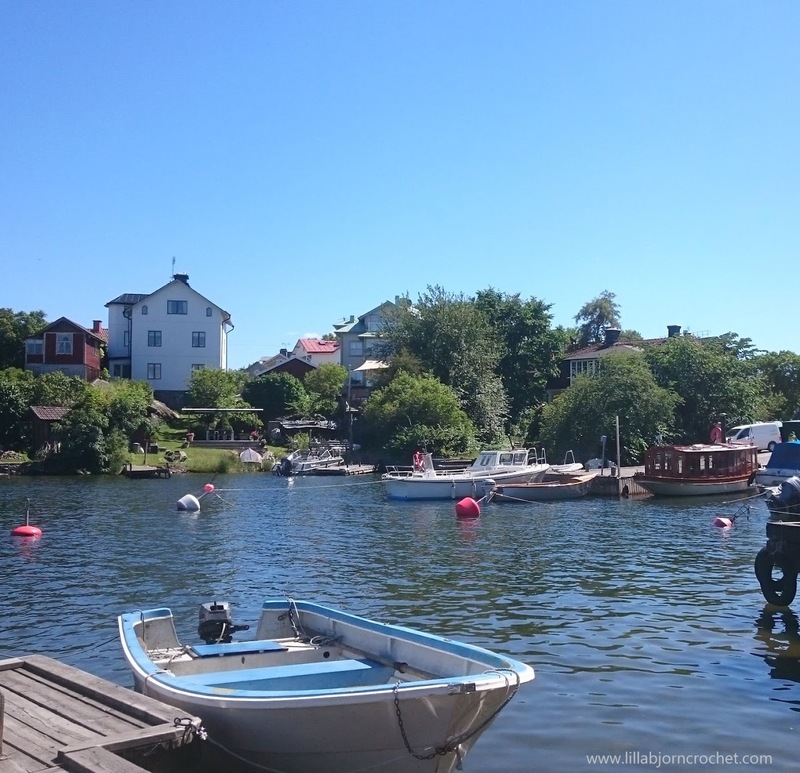 One of them is Vaxholm, often referred to be a capital of Stockholm Archipelago. Vaxholm is just in hour’s ferry ride from Stockholm, and it’s truly a very popular tourist destination. The island is lovely with beautiful houses, calm beaches and lots of cafes and restaurants. We spent long hours here: my husband with a book and me with crochet. Buy a ready-to-print pdf with ALL parts (complete shawl pattern) HERE on Ravelry and HERE on Etsy. If you are using paid pdf please note there were several updates made this week. The chart for Part 4 was re-uploaded, and stitch count in extension after Part 4 (so called “next row”) should be: 148dc and 147 ch1-sps. You can find errata on Ravelry pattern page. An original Lilla Björn Crochet Design (Tatsiana Kupryianchyk). Copyright 2014-2018. All rights reserved. This pattern is for personal use only. It cannot be sold, shared, republished (online and off-line), redistributed, translated without permission or edited in any way – in part or in a whole. Please, always credit me as a designer. Thank you! Would it be possible for you to copy/paste the instructions for the rows that were in previous parts rather than just referencing them? It's kind of annoying to have to have a separate tab pulled up for each week of the MAL so I can flip between them each time I get to a "As row 18." 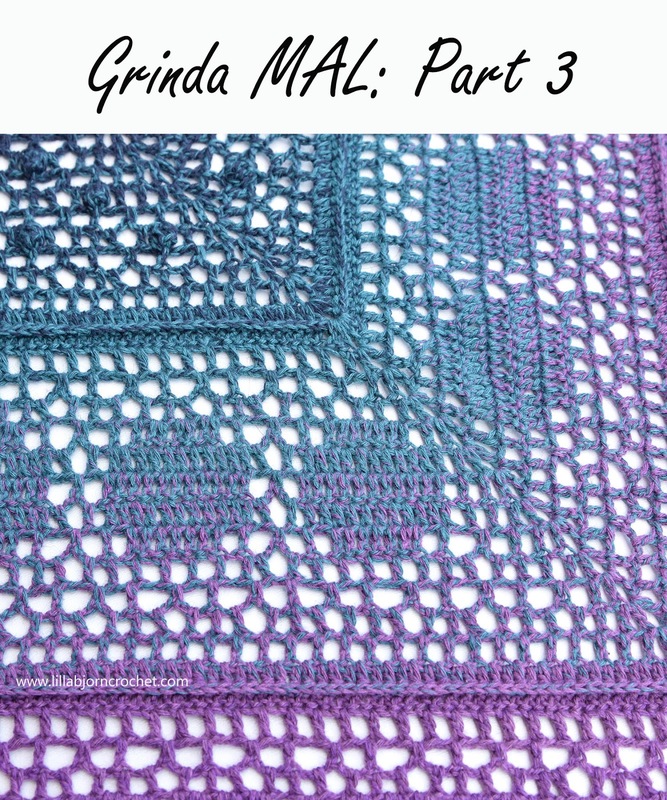 Aside from that, I'm loving this pattern and already debating what Whirl I want to buy next and who I want to make my next Grinda for. Ditto to the comment above - I'm having to dig part 1 out of the recycling to look up what row 6 is! It would be much easier if you could just cut and paste row 6 into row 45. Only just starting part 3 and enjoyed it up to now but this does make it a bit irritating. There is no link to part 4. If you click on the link, it has wrapped to part 5 and that is what you get, so we are missing 15 rows. Can you check this out, please and thank you. What do you mean please? which link is wrong, you think? I'd like to know this too as I've messed up somewhere there and I'm going to have to frog 5 rows now would help if the stitch count was added to avoid mistakes as you only realise when you get to the lace stitch in part 4 that somethings wrong.